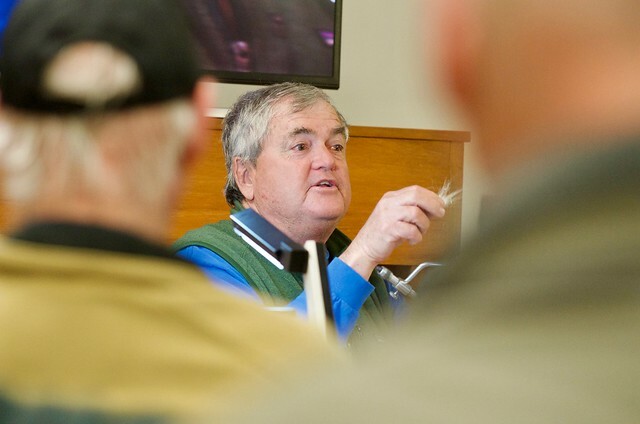 I was at the Dr. Ed Rizzolo Fly Tying Festival in Houston yesterday and Pat Cohen was one the featured guests. 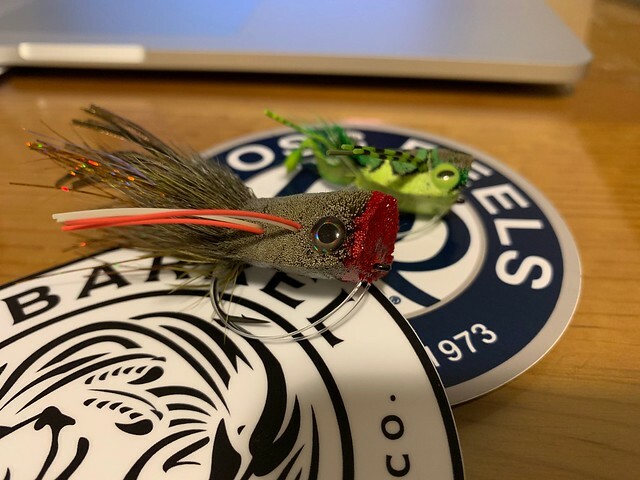 He’s definitely one of the best hair bug fly artists and he gives a good presentation on smallmouth bass on the fly. If you ever get a chance to observe him tying and his techniques you should do it. Fun fact: he is a tattoo artist. Maydelle, you beat me to the punch. I was about to write up a short post about the Dr. Rizzolo Fly Tying Festival! Just to echo your sentiment, it was a great event and awesome to meet and see Pat in person. 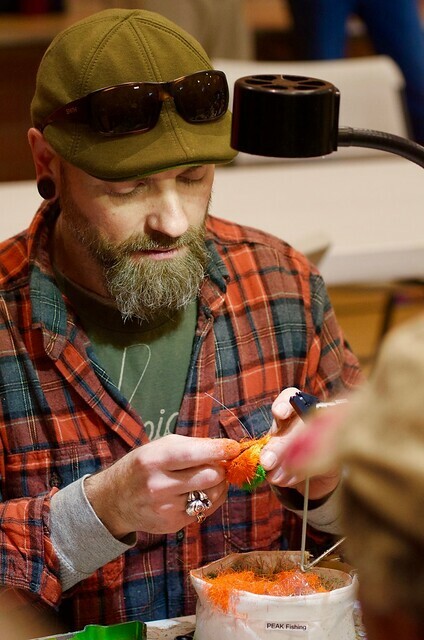 They say it takes 10,000 hours to become an expert at something, but Pat must have double or triple that time at the vise because he's a true artist. He's also a really nice guy to boot and spent about 15 minutes answering my idiot questions. I'm always shocked at how receptive and patient professional fly tiers are to dolts like me when they could just say "want a better bug? Go to my website and enter your credit card." Before I got into tying, I bought a few poppers and divers from Pat, they're still going strong to this day after heavy use, so when he talks about durability being important to him, he isn't joking. Another highlight for me was listening to Capt. 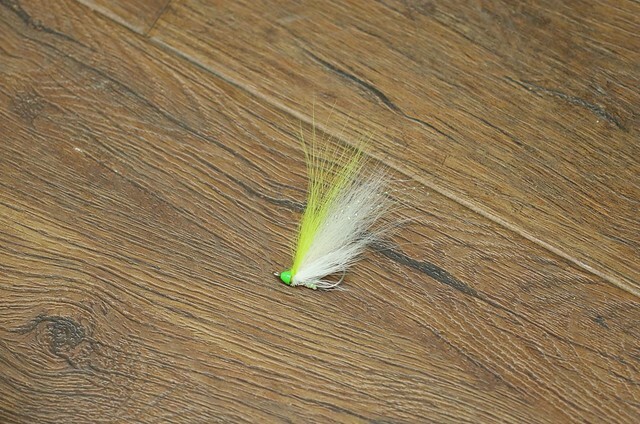 Billy Trimble talk about the electric chicken and his approach to fly tying. 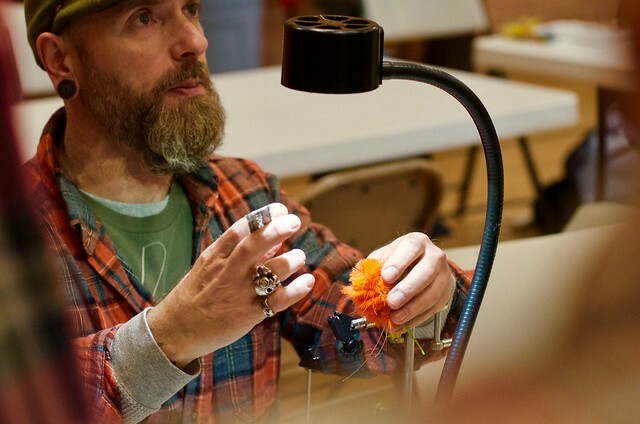 He has a very utilitarian and practical approach to fly tying, if something doesn't have a purpose or reason, it's not going on his flies. Last edited by MassAction; 02/11/19 05:16 AM. You did a much better job than I did. Wish I had waited a little bit. I bow to your editorial supiority. Another tidbit: I make a deer hair packer and a woman I had sold one to a couple of months ago was there and she approached me to show it to Pat. I was a little apprehensive since it will compete with his Fugly packer and I didn’t know how he would react. If he was resentful he didn’t show it. He was very cordial and after his presentation we chatted and I showed him some of my fly designs and he was complimentry. He’s a gentleman and I could see me standing in river waving a stick with him.